This is my first post I’m writing in the brand new gluten free section on my blog. Although not being able to have real pasta/pizza is less than ideal now I’m diagnosed with coeliac disease, I’m glad it is making me a healthier and happier person. My holiday to Croatia was my first trip abroad since being on a strict gluten free diet. 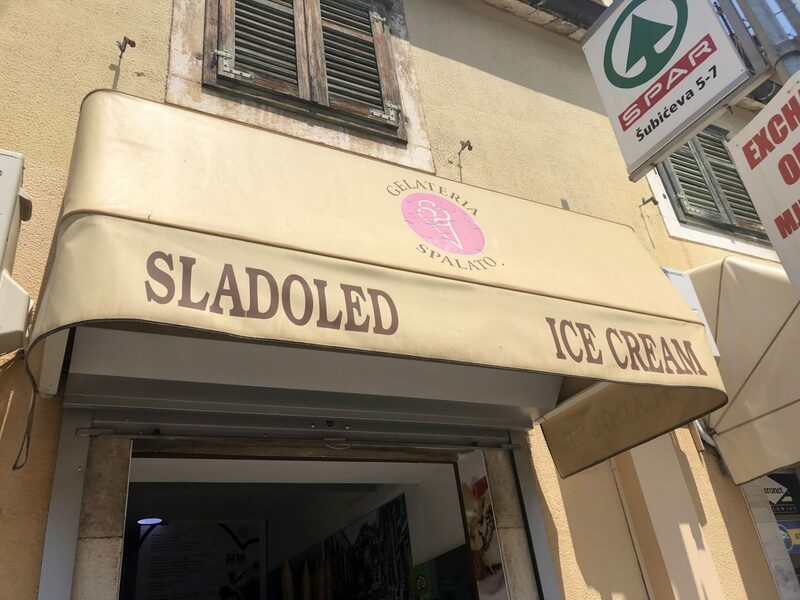 It was a very last minute trip, so time was limited to do much research into places I was able to safely eat at in Split. It was a learning curve to say the least, but here are my recommendations, advice and tasty treats I found. 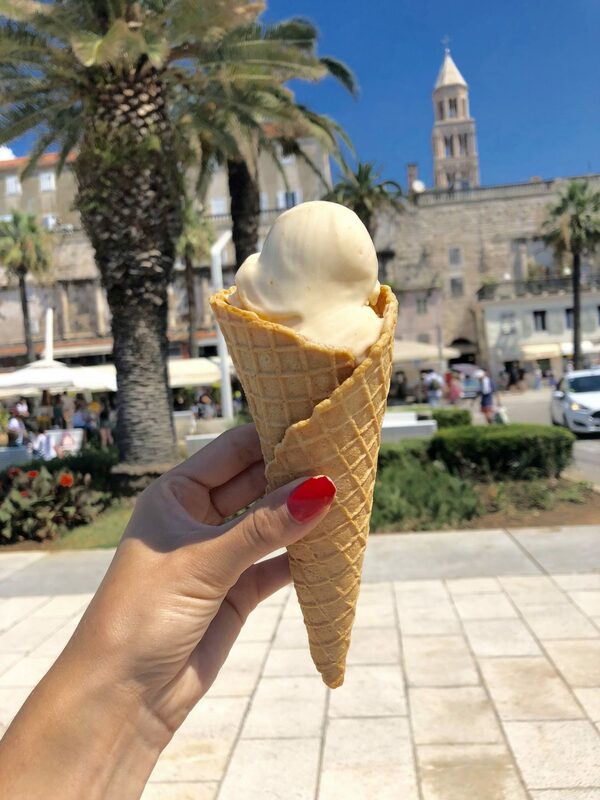 Split is the second biggest city in Croatia and there are an insane amount of restaurants and places to grab some food from. You can’t walk more than a few metres in the narrow streets drenched with the city’s ancient history without walking past a restaurant/bar/smoothie stall. Visiting in the final few days of July, meant that the summer holidays had kicked off and every place was always busy. 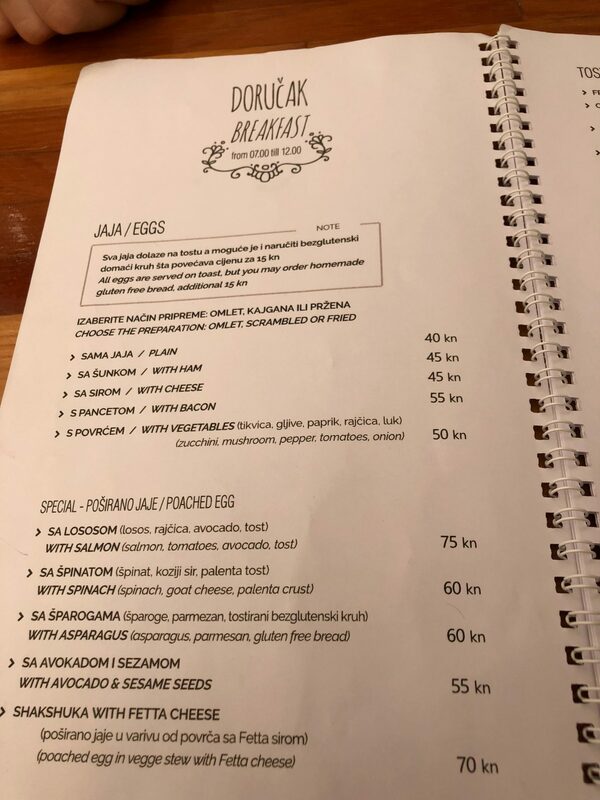 So although it may seem as though there are plenty of places to eat, with many claiming to have “gluten free options”, expect very limited choice in some places (the amount of times I was told there was one salad on the menu I could have, erm no thanks). Do lots of research in advance/ask lots of questions when you get there to avoid cross contamination. I found that when people seemed unsure it’s best to steer clear and stick to places which you know are safe, frustrating as that might feel especially if you are with people who can eaten gluten. I stayed in an apartment which I would recommend. It gives you the freedom to stock your fridge up with food you can eat and enjoy and even cook if you want to. From the advice of many other GF bloggers, I packed some food in my suitcase which tied me over and prevented me from getting too hangry, which helped too (as no one likes a hangry Marcella). Despite this, I did eat some incredible GF food which I will be dreaming about for weeks! I am a massive lover of Mexican food, and I often find it a safe bet as much of it is naturally gluten free. But To Je Tako takes it to the next level by offering gluten free tortillas (which were delicious), so you can dig into their tacos as well as some of their starters and arguably the tastiest nachos I have ever had. 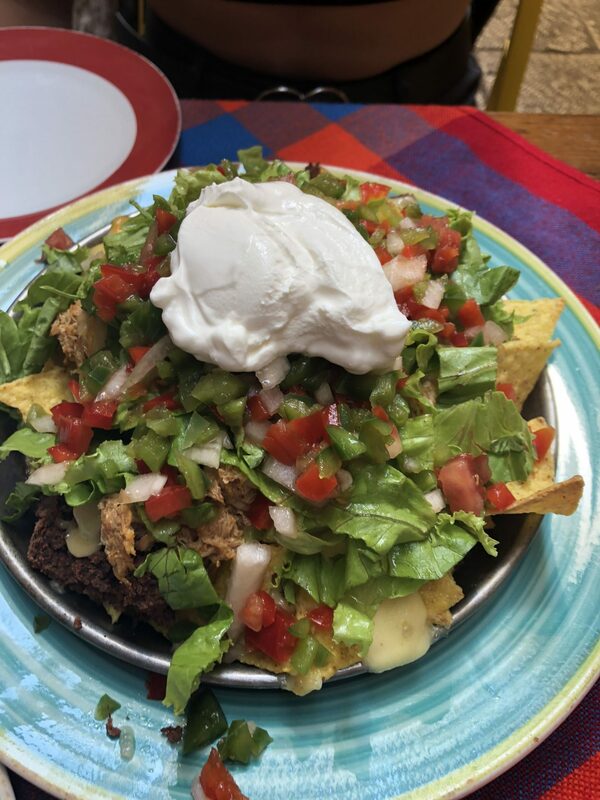 We shared the shredded chicken nachos to start which also came with refried beans, a ton of cheese, salsa, lettuce and sour cream. Would probably just go back to Split for the nachos tbh. 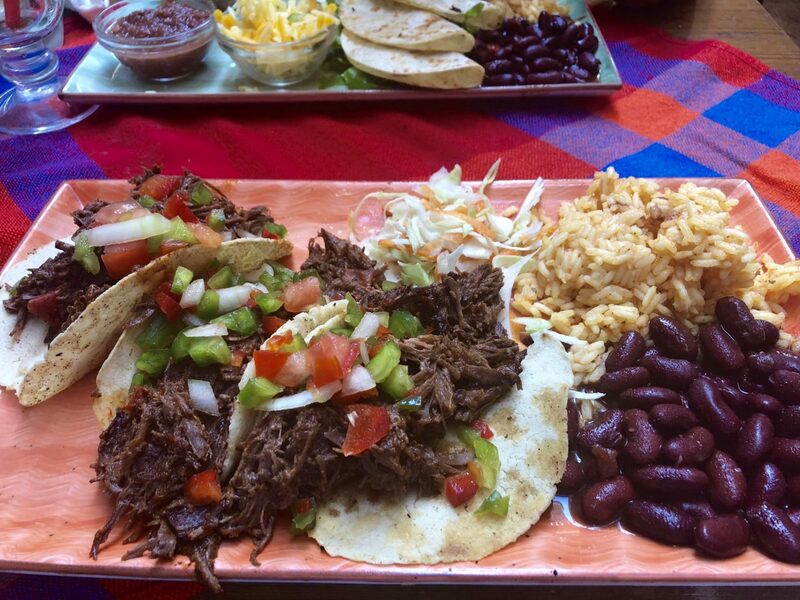 For my main, I opted for the shredded beef tacos which were cooked in cuban spices with sweet tomatoes and were also served with rice, beans and slaw. 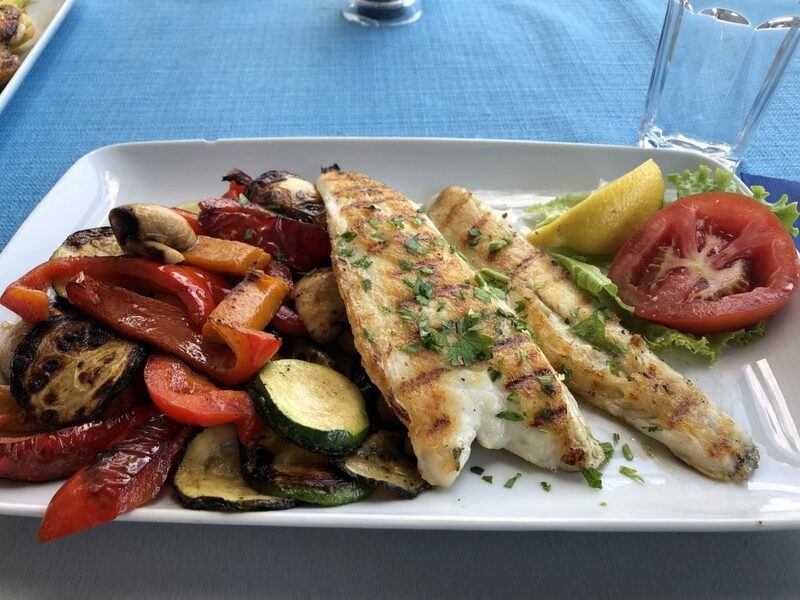 The portions are very generous and it is great value for money, making it a very popular spot in Split. The restaurant doesn’t take reservations and is absolutely tiny, so in the height of summer I would say a lunch time visit is your best bet to avoid waiting too long. And trust me, you won’t leave feeling hungry! 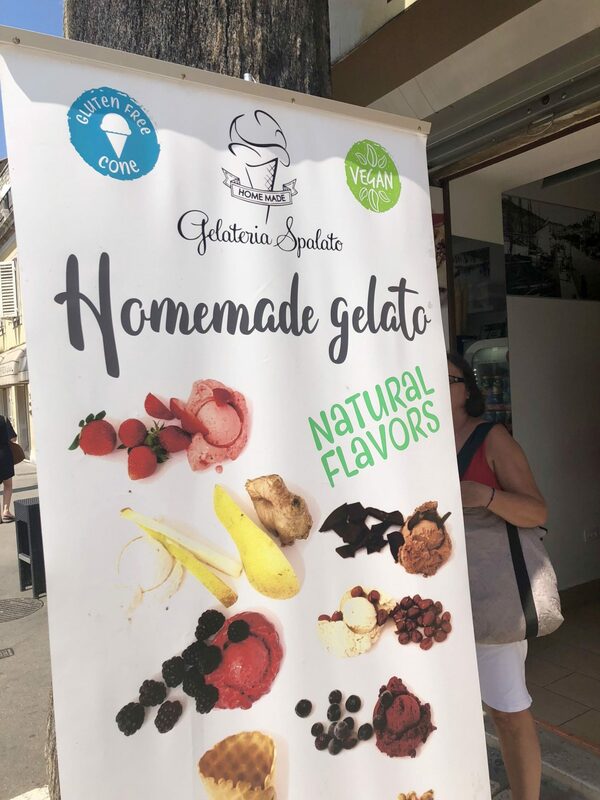 Apart from the fact that their ice-cream is a little taste of heaven (and you can trust this information because being Italian means I have had a LOT of gelato in my time), they also have gluten free cones. And the cones are HUGE. They have a great crunch (ice-cream cone essential) with a slight vanilla aftertaste which I didn’t mind at all. It describes itself as a health food bar and restaurant and there are lots of GF options on their menu. 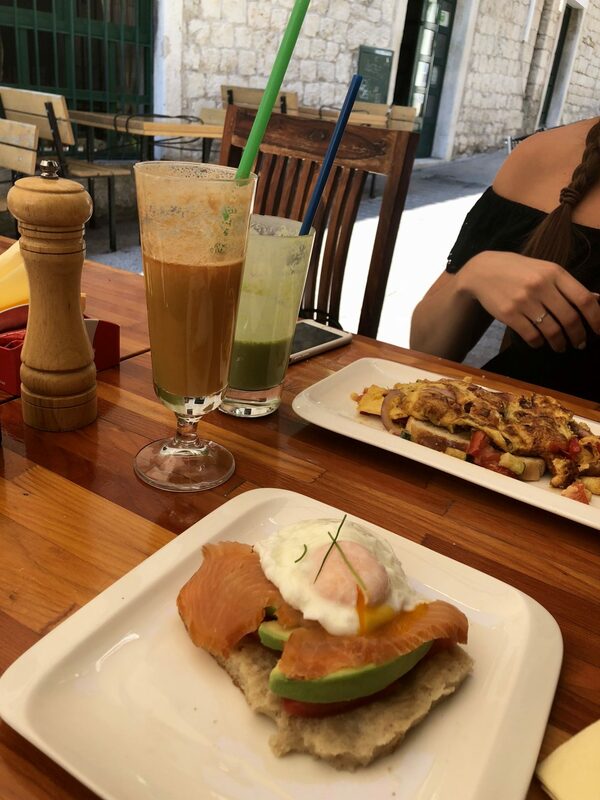 I only discovered this place the morning before we headed back to the UK for a quick breakfast, but when I go back to Split, I would defo revisit to try more of their menu. For breakfast they offer gluten free bed (for a small extra charge) which I had with smoked salmon, avocado, tomatoes and a poached egg. Their GF bread is homemade and it was very unlike the usual super light, cardboard texture stuff with 17 wholes per slice. This bread was dense, slightly wet and slightly sweet which made for a much more filling breakfast. They also had homemade GF crepes and muffins on the breakfast menu (told you I NEED to go back!). Their brunch/daytime menu had other great options including gluten free pizza. They also make great freshly made juices and smoothies which are a refreshing delight especially when it’s 34 degrees and you’ve been walking for miles. 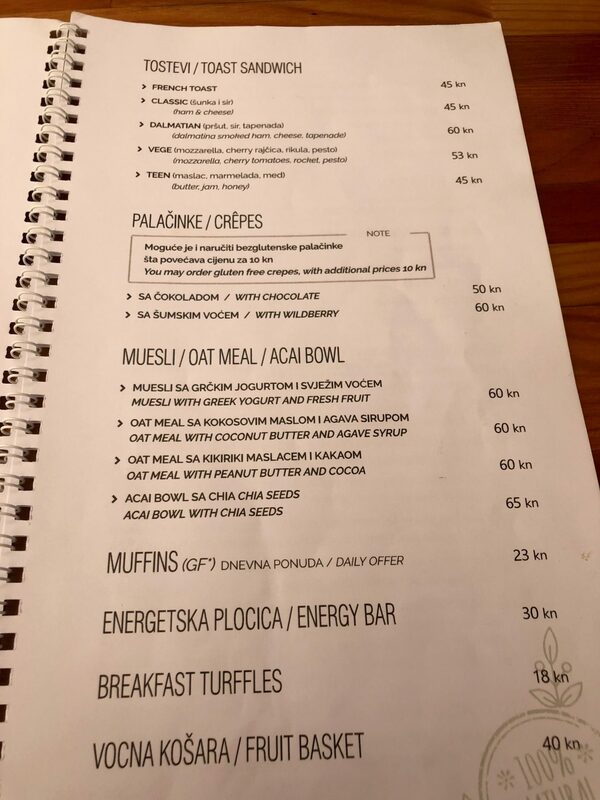 Their menu was clearly labelled with which items were gluten free which meant I didn’t have to quiz them for half an hour over every single ingredient used out of fear of getting ill. When we walked past this restaurant, and my friend suggested we visited the following day for lunch, I was pretty sceptical. Turning up to restaurants having not researched them in advance usually resulted in being told there was nothing available or confused/unsure expressions. Online, I couldn’t find much information, so when I arrived I immediately went into detail about having coeliac disease explaining it wasn’t just the ingredients, but where they cooked it and the utensils they used, having previously been glutened due to probable cross contamination at another restaurant. I was pleasantly surprised with their understanding of how serious it was and they clearly stated what I could and couldn’t eat which reassured me that I wasn’t going to leave feeling ill. They were super nice about it and even offered me substitutions which weren’t on the menu like making me potatoes as I couldn’t eat the chips due to the fryer being used to cook other foods. I chose the monk fish and they served me extra vegetables to make sure I didn’t leave feeling hungry. Makrovega – top of the list on Trip Advisor for GF restaurants in Split. It’s also great for vegetarian/vegan options. And it’s super cheap. Toto’s Burger Bar – As well as burgers (with no buns), they also have gluten free pasta, salads and a sandwich option. Brasserie on 7 – I went for brekkie and had a huuuge tasty omelette. They have options available for each meal and it is a super pretty venue. SPAR – most supermarkets seemed to have one or two GF products, but the Spar in the centre of Split seemed to provide one of the biggest aisles of products. 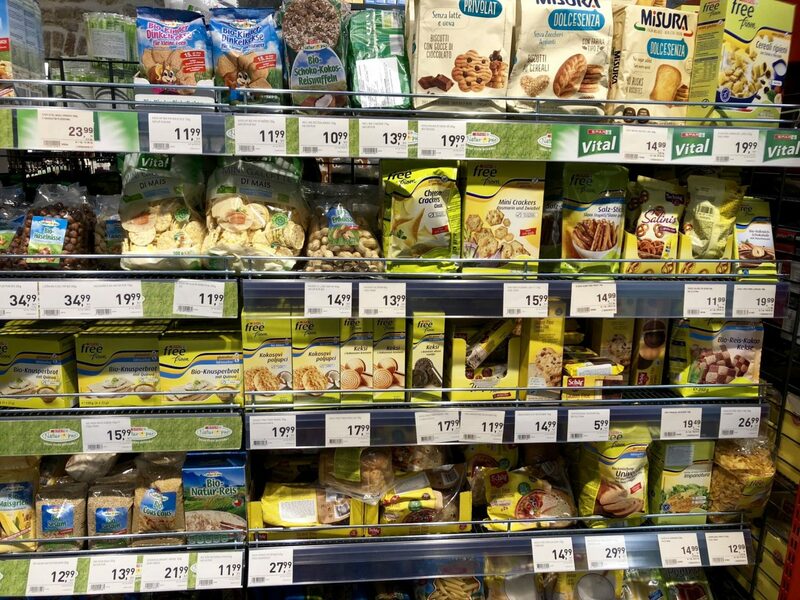 From pasta to bread to GLUTEN FREE CEREAL WHICH WAS BASICALLY “KRAVE” (which I defo bought an extra box of to take home to the UK with me), there are a good range of basics to snack on/cook if you are staying somewhere with cooking facilities. There might not be as much choice as you’d get in London with chain restaurants and independent places, but there are some places in Split I wish I could have here in the UK and will be definitely going back to when I return to beautiful Croatia. Do your research and you can eat pretty well.